Mohammad Naeem Islam is an international cricketer from Bangladesh. 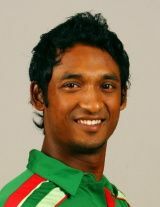 He was born on 31 December 1986 in Gaibandha and is a right-handed batsman and occasional off break bowler. He made his debut for Rajshahi Division in 2004/05 and played through the 2006/07 season, after having represented the full range of Bangladesh representative youth teams and went on to make his international debut on 9 October 2008 against New Zealand. He has scored 3 first class centuries, up to the end of the 2006/07 season, with a best of 126 against Barisal Division and recorded 14 first class fifties. His best bowling, 3 for 63, came against Dhaka Division. He has also made 5 one day fifties. Naeem Islam, a top order batsman and part-time offspinner, was part of the Bangladesh team that won the Plate Championship in the 2003-04 Under-19 World Cup. He made the highest score in the famous triumph in the Plate final over Australia, the defending champions. Find Naeem Islam profile and stats of batting, bowling and fielding including latest updated news of Naeem Islam, videos and images at Hamariweb.com. Also find detail Player profile and career statistics of Naeem Islam of Bangladesh. Naeem Islam - Find Naeem Islam of Bangladesh Cricket Team complete player profile, number of matches, runs score, wickets & catches, Statistics, Records, Naeem Islam Latest News, Naeem Islam Videos, Naeem Islam Photos, and other Naeem Islam Cricket Team players.